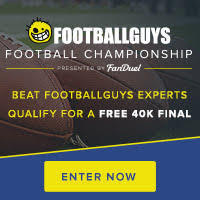 I just posted my Divisional Round FanDuel stacks. I cover highly-owned stacks, less common stacks, matchups with shootout potential, and defensive stacks. Here's one stack idea. Be sure to check out the full article for tons of other stacks. I love stacking the team that the sportsbooks predict to be the highest-scoring underdog. Down early, the Packers will lean heavily on the Rodgers-to-Jones connection. Twist: With Tyrann Mathieu out for the year, the middle of the field should theoretically be the Cardinals' Achilles’ heel. It didn't play out that way in the Week 16 matchup between these two teams, but I could still see Randall Cobb ($6,600) and Richard Rodgers ($5,100) exploiting this weakness if Aaron Rodgers gets going. I prefer Richard over Randall in a triple-stack. Over the last five games, the Cardinals have allowed tight ends to overperform by 42 percent in terms of fantasy scoring. That's the worst percentage of the eight playoff teams. Shootout: All the info from the Cardinals' stack recommendation applies. Pair Michael Floyd ($6,500) with three Packers for an affordable super-stack.